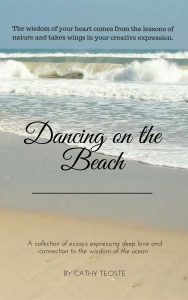 Through this collection of essays expressing my deep love and connection to the ocean and my own inner spirit. I hope to inspire you to connect with nature and your own authentic essence, hear your own deep inner wisdom, discover your own song in your heart and dance the steps to your own unique dance fully embracing life in all of its wonder and awe. The wisdom of your heart comes from the lessons of nature and takes wings in your creative expression. When you show up in the world in a way that is genuine and true to who you really are, your world will shift and change in the most amazing ways. The wisdom of the beach has guided me into my own inner wisdom found deep in my heart and soul and leading me to learn to hear the song of my own soul and the steps of my own joy. I am now learning to dance beyond the breakers.